Emerald Triangle Seeds are so named after the region in northern California comprising of Humboldt, Trinity and Mendocino counties. In the early 70’s and 80’s, a growing number of city dwellers decided to move to northern California into these areas to develop communes, homesteads and other alternative lifestyle communities that broke away from the norms of society. This new found lifestyle was influenced greatly by the use of cannabis. Geographically, it happens to be one of the most optimal places in the world to grow cannabis. This region is special as it falls under the same parallel as where cannabis originates from, in the middle-east. With all that in mind it has allowed many different aspects of worldwide genetics to settle here, furthering their development. 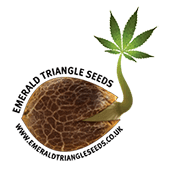 Emerald Triangle Seeds are a group of seven breeders from the aforementioned famous area of California. They have over two decades of cultivation experience between them. A relatively new seedbanks, Emerald Triangle aim to bring quality and stability to every strain. Their passion is focused on providing meticulous care and quality for their strains and to ensure genetic stability through nature. This means that they refuse to discount the role of a male chromosome in their breeding techniques and gene pool. Emerald Triangle state that they are aware of the fact that 80% of the European market is feminised, so don’t disregard it completely. However, the seedbank stand by the fact that regular breeding maintains long term stability, and that’s what you can expect from Emerald Triangle Seeds. The strains in Emerald Triangle’s comprehensive library are not just from California. In fact, they have put a lot of energy into collecting quality genetics from all over the globe. Emerald Triangle Seeds are trying to carry the torch for their generation to preserve and improve the quality of genetics, so that in the future, people will have the same access to the healing and medicinal properties that cannabis has to offer.